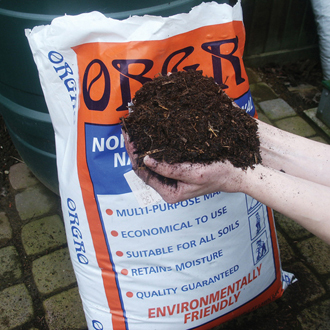 Orgro is concentrated 100% organic manure that is perfect for a host of uses around the garden. Orgro is up to 6 times more concentrated than farmyard manure and a little goes a long way. Yet it is kind to plants and will not scorch them. Each bag will treat 200 sq. yards/184 sq. metres. Orgro can only benefit your garden - apply through the growing season for a bigger blooms and higher yields. - Ogro allows you to feed your garden naturally: it is not factory produced fertilizers nor is it a substitute for farmyard manure. - Orgro is a concentrated organic manure that would provide the nutrients your plants need- ALL OVER THE GARDEN! Orgro gives you the opportunity to feed your garden with 100% natural manure. - Orgro can be used in confidence on lawns, vegetables, bulbs, pot plants, perennials, trees, shrubs, roses, hedges and all types of fruit trees, fruit plants and bushes. - Orgro is safe to use with lime hating ericaceous plants. - Orgro can be used straight from the packet and it is easy to handle. - Orgro is safe to use anywhere in the garden because it is 100% organic and therefore rich in humus. Humus is vital to a healthy plant growth. It aerates and improves the structure of your soil. - Orgro works for you in two ways: the immediate benefit for your plants and the long lasting effect of soil enrichment. - Orgro is 100% organic manure, thoroughly and naturally composted and then shredded to produce a well textured manure which is easy to work with. - Orgro can be used to prepare the ground and as a top dressing during the growing season. The application rates are only a guide. Generally apply Orgro accordingly to the quality of your soil. 3 - 4 handfuls to the sq. yard/meter to the lightly forked or raked in to the topsoil. Flowers and Bedding Plants: before planting out annual and bedding plants fork in 3 – 6 handfuls per sq. yard/meter. Top dress perennials with 2 -4 handfuls per sq. yard/meter in early spring and autumn. Roses: dig in about 4 handfuls under new bushes and spread about 2 - 3 handfuls around each bush in early spring and again when buds are beginning to appear. Lawns: spread about 3- 6 handfuls per sq. yard/meter in the spring and once or twice during the growing season. Water in well during dry weather. Vegetables: fork in 6- 8 handfuls per sq. yard/meter before planting: brassicas, lettuces, onions, carrots, beans and other vegetables. Improve your yields by applying two or three top dressing during the growing season. Fruit Trees and Soft Fruits: apply 3- 4 handfuls in spring and autumn around the base of fruit tress, bushes and canes. Compost: Orgro is an excellent compost activator, it helps to generate heat and enriching the compost. Any left overs can be put to good use in the compost heap. Liquid feed: soak the well punctured bag in the large tank (or use a polythene bag in a bucket). The resulting liquid will treat the area even larger than 184 sq. meter/220 sq. yard per bag we claim for dry use. Please Note: Orgro is highly moisture absorbent and it means that the weight of the sack may vary by several pounds. The volume in each sack is the same - you will get the same coverage from the sack.